The Paleo diet is trendy and currently very popular. It is based on the concept that during the Paleolithic period, or Stone Age, our ancestors’ diets were very different to our modern diet, and they did not suffer from any of the common chronic diseases prevalent in our society. The theory proposes that if we were to eat more like our caveman ancestors, we could eradicate many of these chronic, lifestyle-related diseases. The Paleo diet consists mainly of meat, fish, seafood, vegetables and fruits. The Paleo diet forbids dairy of any kind, and does not allow grains and legumes. What’s right about the Paleo Diet? There is no question that the agricultural revolution, together with modern food manufacturing processes, have greatly changed the quality of the food we eat, and what we eat. Although we live in an age of plenty and have a vast variety of foods to choose from, health quality has deteriorated, with more and more people suffering chronic diseases, obesity rates rising, and quality of life decreasing. Most authorities are certain that our diet plays a major role in the cause of these problems. Food quality has deteriorated, with much of our food being highly refined and vastly processed. We eat too much sugar and consume too many fats. Most people are often not aware of the high sugar and fat levels in the manufactured foods they eat because it is added to the food during the manufacturing process, and as a result, it is invisible to the consumer. 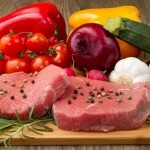 · There is less processed food in the diet, and this is a health benefit. · There is a decrease in sugar intake, which improves blood sugar levels and decreases insulin resistance. However, despite some of the benefits, there is also a downside to the Paleo diet. The Paleo diet is based on the principle that we are eating what our caveman ancestors ate. But that’s not quite true because we don’t really know what they ate. Their food choices were very limited; and their food intake was highly dependent on season, weather, and the availability of food in their geographic region. Furthermore, early humans were hunter-gatherers. They were very active. They did not eat three meals per day. They only ate when they hunted and caught their prey, or when they found some nuts or berries that were in season. Paleolithic man’s life expectancy was relatively short. They rarely lived beyond the age of 40. Compare this to modern man who now often lives beyond the age of 80. Therefore it may not be their food intake that made the difference, but rather the fact that they rarely lived long enough to develop the chronic diseases of old age. The restrictions of the Paleo diet on the intake of legumes and wholegrains leads to a decrease in the level of insoluble fibre in the bowel. This form of fibre is necessary not only to keep the bowels moving and regular, but also to provide protection against colon cancer. The lack of intake of dairy could lead to low calcium levels, a decreased bone density, and an increased incidence of osteoporosis. Another problem with Paleo is the expense. Many of the proteins recommended are expensive, and this could be tough for many people on a budget. There are many things wrong with the Paleo diet. I have addressed many of the issues above. But there are two that stand out – dairy intake and fatty meat intake. I see no reason why dairy should be disallowed as part of a healthy diet. All the latest evidence suggests that the right dairy in your diet will increase fat loss and decrease muscle loss. This makes it a highly desirable protein in a diet that seeks to achieve healthy weight loss.